ST. GEORGE – As the nation’s economy improves and jobless rates drop, Utah’s workforce is faring well and Southern Utah unemployment rates have hit their lowest level in five years. 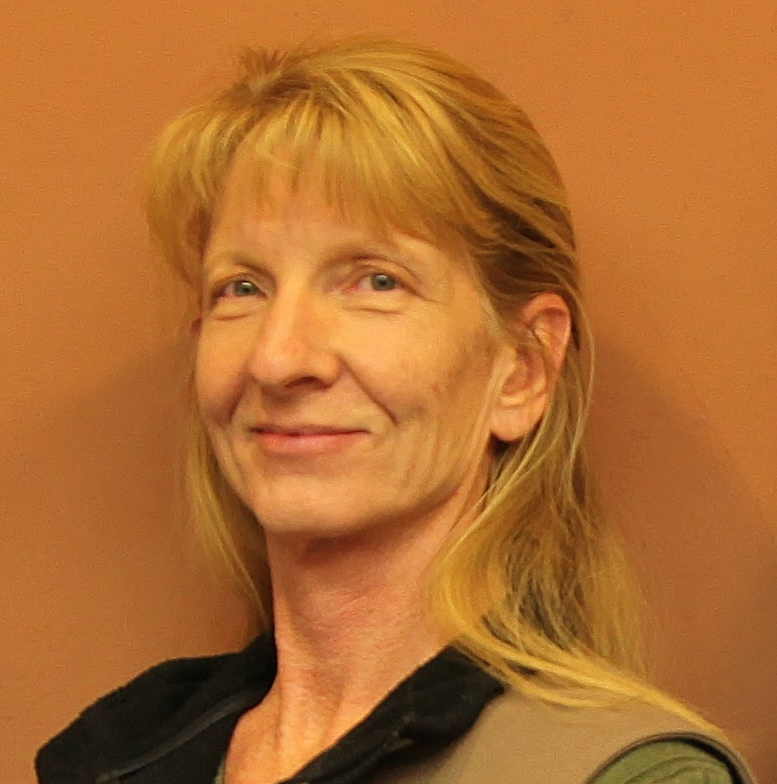 Most southwest Utah counties found themselves in job-creation mode during the second quarter of 2014, with unemployment rates reaching the lowest levels in half a decade, Lecia Langston, senior economist for the Utah Department of Workforce Services, said. A tighter labor market may begin to put upward pressure on wages in the larger counties. Washington County’s unemployment rate has been edging steadily downward, and measured 3.8 percent in September 2014, Langston said. “That’s down more than a percentage point since last year and marks the lowest level in six years,” she said. 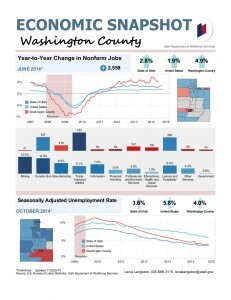 While Washington County’s first quarter 2014 performance raised concerns of an overheating economy, second quarter employment figures have reverted to a healthy growth rate, Langston said. Iron County, with two good quarters of employment growth under its belt, appears to have finally shrugged off its lackluster post-recession performance to embrace recovery. “Iron County’s unemployment rate dropped almost a percentage point over the past 12 months to register 4.2 percent in September 2014,” Langston said. In Kane County, following a full year of employment additions, the rate of year-to-year nonfarm employment expansion reached its highest level of the post-recession era, Langston said. On the other hand, after a three-year stretch of job losses, Garfield County has managed a bit of year-to-year job growth; and Beaver County lost jobs. Neither county will be economically sound until they can show consistent employment gains across a broad range of industries, Langston said. 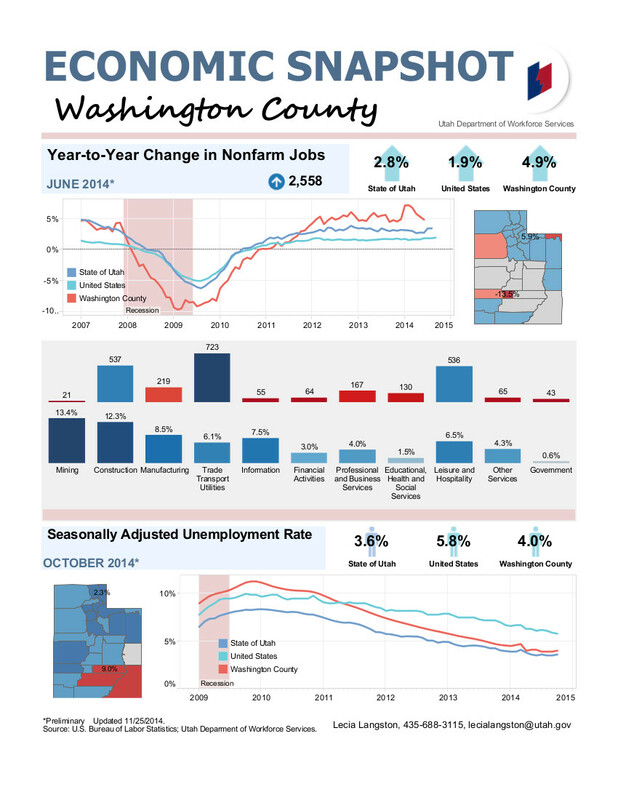 Between June 2013 and June 2014, Washington County’s nonfarm unemployment measured just below 5 percent. The dropping nonfarm employment reflects the addition of nearly 2,600 positions. Every major industry added employment. Leisure/hospitality services and construction placed neck-and-neck for job creation honors, each showing a net gain of nearly 540 positions. Transportation/warehousing, retail trade and manufacturing also added notable numbers of new positions. Due to slippage in state and federal sectors, public sector employment increased by less than 1 percent. The nature of government budgeting often results in the public sector trailing during all legs of the business cycle. The county’s unemployment rate edged ever downward to measure 3.8 percent in Sept. 2014 – down more than a percentage point since last year and the lowest level in six years. An unemployment rate this low suggests the labor market is tightening and should result in upward pressure on wages. Gross taxable sales remain strong with a 9.2 percent year-to-year gain in second quarter 2014. Sales gains proved particularly strong at motor vehicle dealers, general merchandise stores and accommodation/food establishments. Initial claims for unemployment insurance remain at a low level. 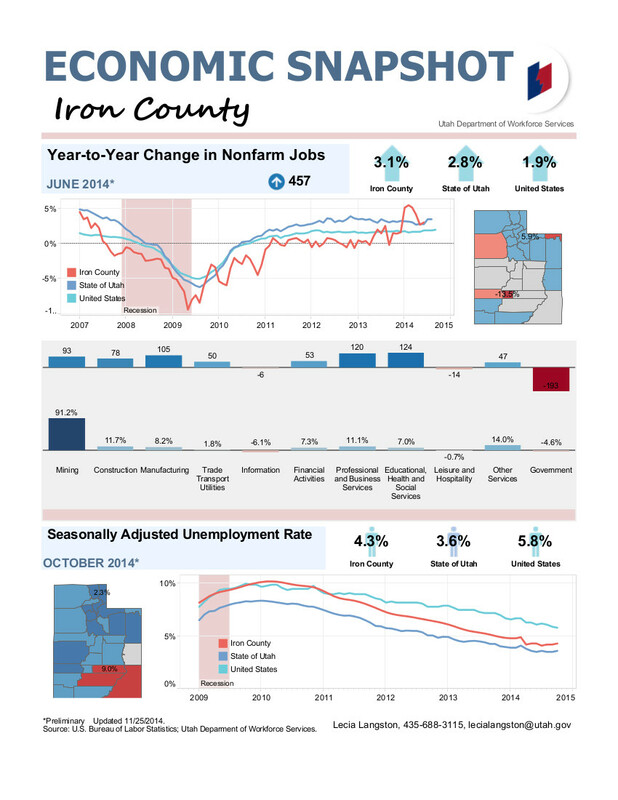 Iron County showed an increase in nonfarm jobs of 3.1 percent over the past year, with almost 460 new jobs as of June 2014. Professional/business services created the largest number of new positions in June – almost 130. Healthcare/social services and manufacturing also showed strong employment gains, each adding nearly 110 new jobs. In addition, mining and construction made notable gains. The only employment decline of note occurred in the public sector, with state government proving the major cause of job loss. Iron County’s unemployment rate dropped almost a percentage point in the past 12 months to register 4.2 percent in Sept. 2014. The unemployment rate in Iron County is approaching the full-employment range. Further declines in unemployment will likely result in higher wages. Gross taxable sales continued to show robust gains, marking almost three straight years of improvement. Between the second quarters of 2013 and 2014, sales rose by more than 6 percent. Wholesale trade, building materials stores, general merchandise stores and food/accommodation establishments generated particularly strong gains. Initial claims for unemployment insurance have settled into a low, seasonal pattern. The three industries with the largest number of claims all have seasonal/temporary job components: construction, employment services and leisure/hospitality services. In the 12 months preceding June 2014, Kane County added nearly 190 net, new jobs for a growth rate of 5.4 percent. Tourism drove the current employment boost, and both retail trade and leisure/hospitality services generated almost all the new jobs. Most other major industries either lost a few positions or gained a few positions. In September 2014, the county’s jobless rate registered at 4.3 percent, down a full percentage point over the past year. Kane County’s unemployment rate remains wedged between the low statewide rate of 3.6 percent and the much higher U.S. rate of 6.1 percent. Gross taxable sales generated a year-over gain of 5.2 percent in the second quarter of 2014, marking a favorable improvement over the county’s first-quarter loss. Beaver County’s nonfarm jobs total dropped by more than 50 positions between June 2013 and June 2014 for a decline of 2 percent. While construction employment deteriorated dramatically, leisure/hospitality services shed even more jobs. In addition, mining and covered agricultural positions contracted. On the positive side, retail trade and manufacturing created a notable number of new positions. Despite job loss, Beaver County’s unemployment rate continued to ebb. Most construction workers undoubtedly returned to their resident counties, and out-migration figures suggest some unemployed workers have left the area. In September 2014, Beaver County’s unemployment rate estimate measured only 3.2 percent – lower than even the statewide average. First-time claims for unemployment insurance remain historically low. In the 12 months preceding June 2014, Garfield County generated a net gain of roughly 20 new jobs for an increase of 0.6 percent. A robust 60-job gain in leisure/hospitality services and a 20-position increase in professional/business services were partially offset by losses in most other industries. In particular, healthcare/social services and the public sector displayed notable declines. Garfield County’s jobless rate has trended downward due, in part, to out-migration. In September 2014, the county’s unemployment measured 7.6 percent, down two full percentage points from September 2013. The county’s seasonal tourism-based economy results in Garfield County’s rate registering higher than most counties. Indeed, it ranks third-highest in the state behind neighbors Wayne and San Juan counties. On a year-to-year basis, the county’s gross taxable sales increased by almost 4 percent in the second quarter of 2014. Although not always positive, gross taxable sales have provided the strongest improvement among the county’s economic indicators. The current progress can be largely traced to strong sales at accommodation establishments. Initial claims for unemployment insurance have relaxed into a seasonal pattern similar to that in the pre-recession era. Lets talk about the outstanding wage growth in southern utah???? Good suggestion. I hear Utah government boasting about these unemployment figures while nothing about wages and earnings. I hear them talking about more taxes for more revenue (to increase government worker wages?). If you gotta problem with walmart wages you got a problem with Murica’. Walmart is a great ‘murican company. Try and get a job in the area with forty hour weeks.. Obamacare took care of that. Young workers getting no more than $10 per hour still can’t rent, pay insurance, utilities, gas to get to work and feed themselves. Young workers making 10 an hour?? Try EVERYBODY…. we have jobs in this town just not careers…. sorry folks multi level marketing is not a career. Thank you Obama for the recovery from that disaster called Bush who drove this country into the worst recession since the great depression and saddled taxpayers with his $1 trillion war and his failed $1 trillion economic stimulus plan. Washington County has the second or third worst housing collapse in the nation and 11% unemployment under Bush. Yes, thank you Obama!